We had lots of surprises in store for the kids at camp today. First of which was a camp volunteer dressed as a solider in the Lord’s army. Jeremiah did a great job showing the group that faith isn’t just idea we have, but a shield we put on everyday. Jeremiah making his grand entrance onto the soccer pitch holding his shield of faith. After Jeremiah grabbed everyone’s attention, Solomon followed up with a lesson on how we can use our faith as a shield, specifically when we’re scared. After Solomon volunteered that when he was little he was scared to cross the road, hands shot up everywhere. One little girl said she was afraid of dogs (further evidence to support my earlier post). Once the group broke off into teams, discussions got personal, which we love. I love that the Americans are getting done with the day saying they’re learning, too. Everyone has something to offer, and even if it is just a week of time to love on some kids, we’re doing it whole-heartedly. Abraham and Brian being silly while making their shields of faith. The real fun came when we broke out the tin foil. Some of these kids have never seen aluminum foil before, but today they got to wear it as the armor of God. Arise Africa staff member Megan, introduced Ephesians 6 for the teams to reference as they dressed up. With our “armor of God” it was a little hard to walk. Soldiers in the Lord’s army all decked out. This afternoon we spent time at Cheshire Home. A place were severely disabled children live full-time. The complex also has a day school and therapy center. Our only job was to love kids. Some kids couldn’t speak, some kids couldn’t walk, but everyone could smile. Coloring was a huge hit, and nine-man wheelchair race finished off the afternoon. Eliza doing a great job manning the coloring table. We had planned all along to leave the crayons for everyone, but when it came time to clean up a gallon size ziplock worth of crayons had disappeared into everyone’s pockets. Jake making the trek back up to the dormitories. With the week winding down, it was no surprise that the conversation around the dinner table was passionate and compassionate. 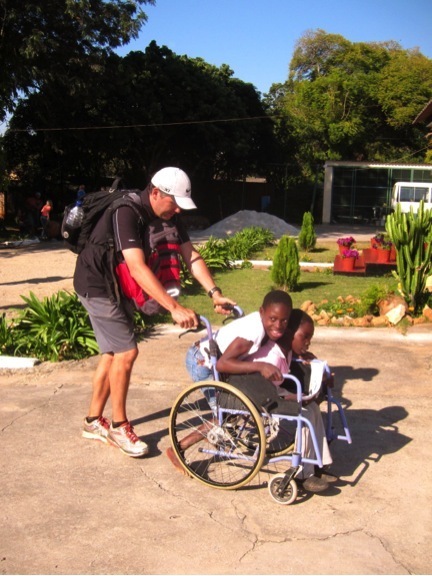 Everyone sees there is a need here that goes well beyond a mission trip, or a year here. That’s why Arise Africa is committed to linking arms with existing schools and following the lead of our local staff. The theme of this week is faith. As a missionary organization working with kids, faith exactly describes the why behind continuing to work in an area where putting a child through school for a year can look like just putting a child through school for a year. We continue to do it because we have faith that this is the work God has called us to do, and even if we can’t see the whole picture, God can. He knows how that one child who only got to go through a year of school with us before his parents took him to a remote village is going to play into His master plan. We don’t know, but we have faith because we know that He does.